Fits a foot or leg of about 8.5 [9.5] inches. 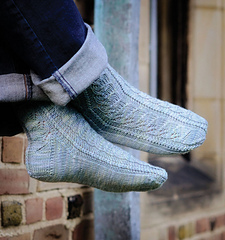 These socks are surprisingly easy, despite their undeniably impressive appearance. The twisted columns and deeply embossed leaves carry right through to the heel and toe for a pleasingly polished look.